In this article, the different types of relays like overload protection relay, solid state relay, solid state contactor relay, Buchholz relay, Mercury Wetted relay and many more are explained with diagrams. . In my earlier post I have alreaady explained the working of relays, and their design and construction. Now, let us take a look at the types of relays that are available for industrial use. As relays are used in industrial purposes very often, they are mostly controlled with the help of computers. But when relays are controlled with such devices, there will surely be the presence of semi-conductors like transistors. This will in turn cause the presence of voltage spikes. As a result, it is really necessary to introduce voltage suppression devices, otherwise they will clearly destroy the transistors. This voltage suppression can be introduced in two ways. Either the computer provides the suppression or the relay provides the suppression. If the relay provides the suppression they are called voltage-suppression relays. Â In relays voltage suppression is provided with the help of resistors of high value and even diodes and capacitors. Out of these diodes and resistors are more commonly used. Whatever device is used, it will be clearly stated in the relay. 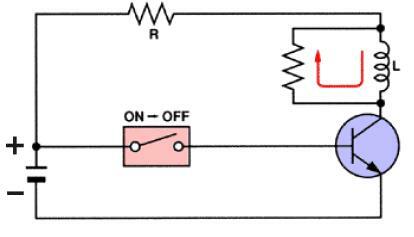 Take a look at the diagram of a voltage suppressed relay with the help of a diode. A diode in the reverse-biased position is connected in parallel with the relay coil. 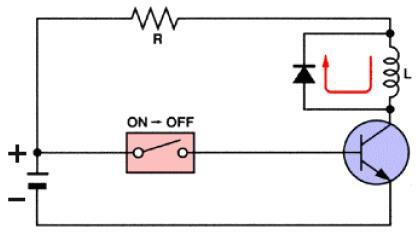 As there is no flow of current due to such a connection, an open circuit of the relay will cause the current to stop flowing through the coil. This will have effect on the magnetic field. The magnetic field will be decreased instantly. This will cause the rise of an opposite voltage with very high reverse polarity to be induced. This is mainly caused because of the magnetic lines of force that cut the armature coil due to the open circuit. Thus the opposite voltage rises until the diode reaches 0.7 volts. As soon as this cut-off voltage is achieved, the diode becomes forward-biased. This causes a closed circuit in the relay, causing the entire voltage to pass through the load. The current thus produced will be flowing through the circuit for a very long time. As soon as the voltage is completely drained, this current flow will also stop. Take a look at the figure given below. A resistor is almost efficient as that of a diode. It can not only suppress the voltage spikes efficiently, but also allows the entire current to flow through it when the relay is in the on position. Thus the current flow through it will also be very high. To reduce this, the value of the resistance should be as high as 1 Kilo Ohm. But, as the value of the resistors increases the voltage spiking capability of the relay decreases. Â Take a look at the circuit diagram below to understand more. Here is a detailed list of the different types of relays. Latching relays are also called impulse relays. They work in the bistable mode, and thus have two relaxing states. They are also called keep relays or stay relays because as soon as the current towards this relay is switched off, the relay continues the process that it was doing in the last state. This can be achieved only with a solenoid which is operating in a ratchet and cam mechanism. Â It can also be done by an over-centre spring mechanism or a permanent magnet mechanism in which, when the coil is kept in the relaxed point, the over-centre spring holds the armature and the contacts in the right spot. This can also be done with the help of a remanent core. In the ratchet and cam method, power consumption occurs only for a particular time. Hence it is more advantageous than the others. 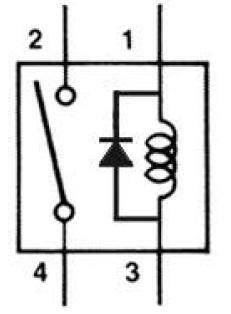 These types of relays have been given more importance in the contacts. In order to protect them from atmospheric protection they are safely kept inside a vacuum or inert gas. Â Though these types of relays have a very low switching current and voltage ratings, they are famous for their switching speeds. This type of relay has been given more importance on its sensitivity. These relays have been used since the invention of telephones. They played very important roles in early telephone exchanges and also in detecting telegraphic distortion. The sensitivity of these relays are very easy to adjust as the armature of the relay is placed between the poles of a permanent magnet. This relay is actually used as a safety device. They are used for knowing the amount of gas present in large oil-filled transformers. They are designed in such a way that they produce a warning if it senses either the slow production of gas or fast production of gas in the transformer oil. As the name implies, these relays are used to prevent the electric motors from damage by over current and short circuits. For this the heating element is kept in series with the motor. Thus when over heat occurs the bi-metallic strip connected to the motor heats up and in turn releases a spring to operate the contacts of the relay. This relay is almost similar to the reed relay explained earlier. The only difference is that instead of inert gases, the contacts are wetted with mercury. This makes them more position sensitive and also expensive. They have to be vertically mounted for any operation. They have very low contact resistance and so can be used for timing applications. Due to these factors, this relay is not used frequently. This is one of the most famous industrial relay. They are mainly used for the controlling of all kinds of machines. They have a number of contacts with easily replaceable coils. This enabkes them to be easily converted from NO contact to NC contact. Many types of these relays can easily be setup in a control panel. Though they are very useful in industrial applications, the invention of PLC has made them farther away from industries. This is one of the most heavy load relay ever used. They are mainly used in switching electric motors. They have a wide range of current ratings from a few amps to hundreds. The contacts of these relays are usually made with alloys containing a small percentage of silver. This is done so as to avoid the hazardous effects of arcing. These type of relays are mainly categorized in the rough use areas. So, they produce loud noises while operated and hence cannot be used in places where noise is a problem. SSR relays, as its name implies are designed with the help of solid state components. As they do not have any moving objects in their design they are known for their high reliability. These relays combine both the features of solid state relays and contactor relays. As a result they have a number of advantages. They have a very good heat sink and can be designed for the correct on-off cycles. They are mainly controlled with the help of PLC, micro-processors or microcontrollers. I’m stuck. can you help with the basics ? I am a little confused about mixing voltages. I want to use a 12 volt relay coil to control a 120VAC circuit. In other words, instead of a 110V rocker switch, I want to use a 12 volt DC switch from a few feet away to pull in the relay and complete the 120 VAC circuit. The AC circuit will have up to 10 amps passing thru the contacts. When I see a standard 12 volt relay that is rated for 40 A…is that sufficient? If not, what should I look for as far as relay capacity? thanks for your information.i use it for my lecture. thanks, lot of useful information. If you can help please? i want to make projects on transducers. please send all information abt these, what is the max. range we can get output of piesoelectric transducer. Hi kirubanidhi it is to be corrected in serial no8 from contacor to contactor. thanks for spotting the mistake. Dear Sir/Mam please correct the spelling for CONTACTOR by the following Sr No 10. Solid State Contacor Relay. Otherwise your datas are very usefull to us. John, I do not know anything about electronics but have an idea and want to build a product and need a mini light on a timer. Needs to be small. I am looking for a mini light that when turned on will stay on for 10 minutes and then go off. nice answers.. thank u.. need many more technical answers like this..